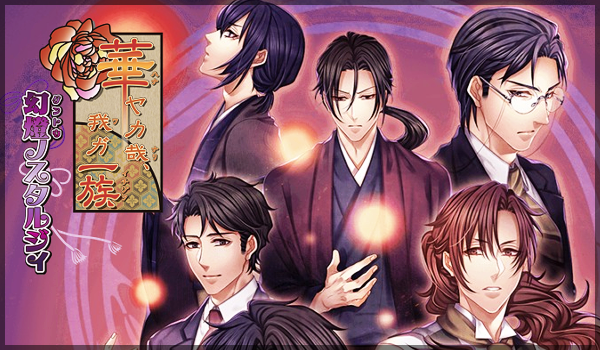 This game follows Hanayaka Nari, Waga Ichizoku Modern Nostalgie, containing its two sequels. If you've played that one, you'll be familiar with the gameplay. I double-checked the guide for 100% Memoir lists, but there could be mistakes with the lefts and rights in the Map sections :') Everything is visibly marked on the in-game maps so you'll be able to find your way around. When starting up for the first time, the game will load for a while. One-time thing only. Exit your room, go down into door, go down to the baskets to start. Interact with the baskets to hang laundry on the lines. Each line has four slots, and the laundry goes from small (one slot), medum (two slots), and large (three slots). So for example, you can go small/small/small/small, medium/small/small, medium/medium, etc., you get the idea. To remove an item from the line, on the line and select it. Press to put back an item the girl is holding. You can tell the size of the item by the size of the bundle in the girl's arms after she picks it up. Don't worry, it's not as complicated as I'm making it. 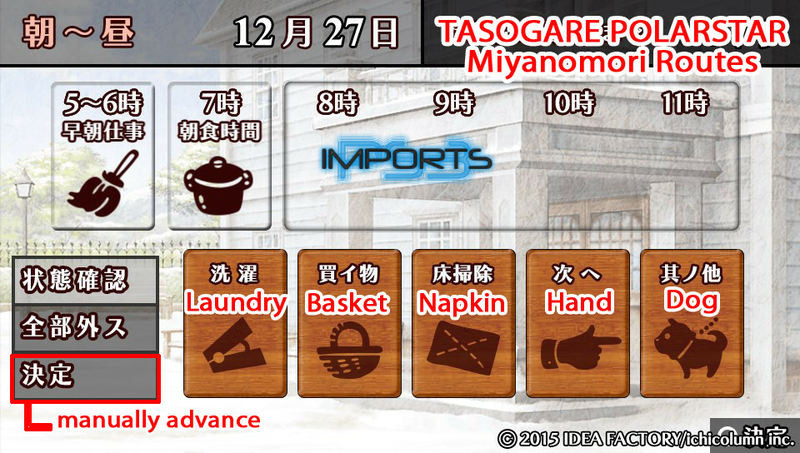 After completing it, you must advance the time of day to then "pick up" the laundry (just go near the laundry lines). To advance, open the menu, choose the ninth option, then the leftmost option. If you advance to a rainy day, however, you fail the game. So only do this minigame when it's a sunny day, which you tell by the window in your room when you enter a Map section. Do this minigame after completing that Map section's quests, since quests are affected by the time of day. We need to play them a lot in the first route, but after that it's only a handful of times per route to get the minimum required stats. They're all timed but very easy. Laundry: Works the same as the first game. First route only. 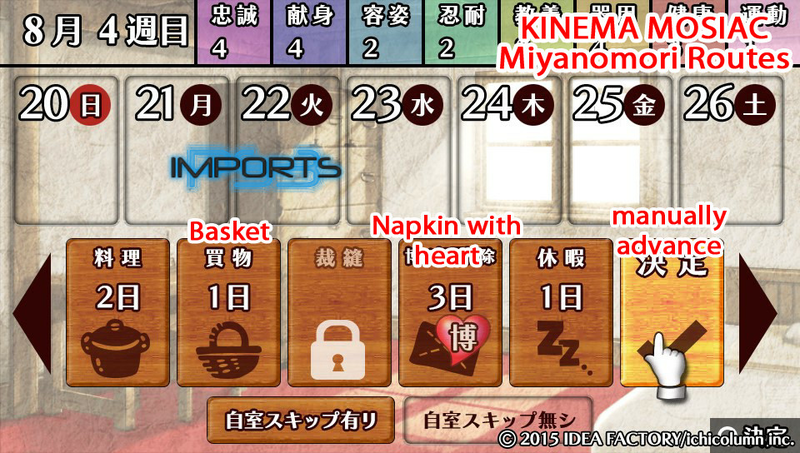 Basket: Search the map for a character with a food icon above their head. Return to the old lady you started near to finish the game. The number on the top left indicates how many characters are left. Napkin: Move across the greyed spaces on the floor to clean them. You need to go over some spaces more than once. Cross the finish line at the end when you're done. The number on the top left indicates how many spaces are left. Cooking: An arrow will point to objects in the kitchen you need to interact with . Simply go around until the top-left counter reaches 0. First route only. Camera: Search the map for butterflies. Press then to take its picture. The number on the top left indicates how many butterflies are left. Notes: Works the same as the Basket minigame. - You can tell by now this not a straightforward, choice-only visual novel. The bulk of gameplay will be some minigames and walking around a map like a RPG. Also keep in mind that it's two full-fledged games in one, though the second one is significantly shorter. - (Kinema) If you are outside and do not see a quest when there should be one, it's because it's raining and you need to change the time of day. Open menu, ninth option, and choose whatever is selected. This doesn't affect indoors quests. 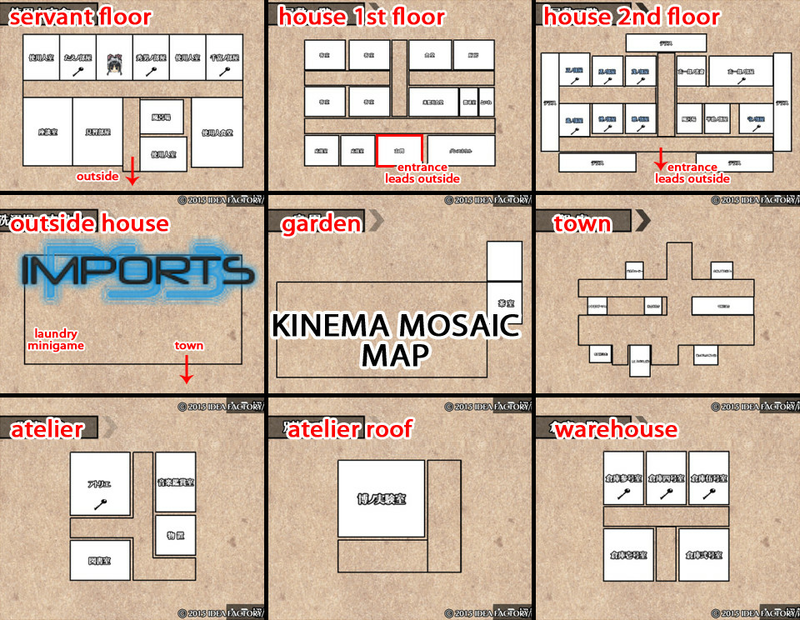 - (Kinema) Feel free to keep spare saves. You can safely start saving from Slot 10 and down. 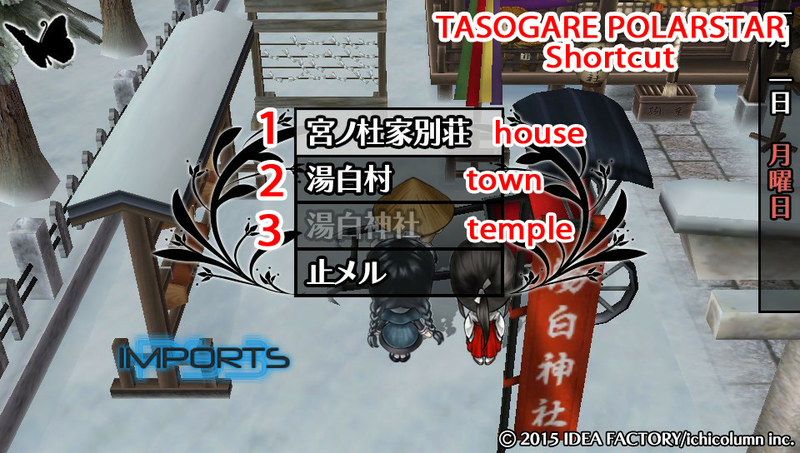 - (Tasogare) We won't be reloading saves for this game, but do save your progress at regular intervals. Always choose the left image when starting up. Press , then left option. Repeat. STATS: I will refer to this section as "STATS" from here on. You select icons and place them on your schedule. Each icon occupies a certain number of days, so even though there are 7 days, two icons may fill it up completely. 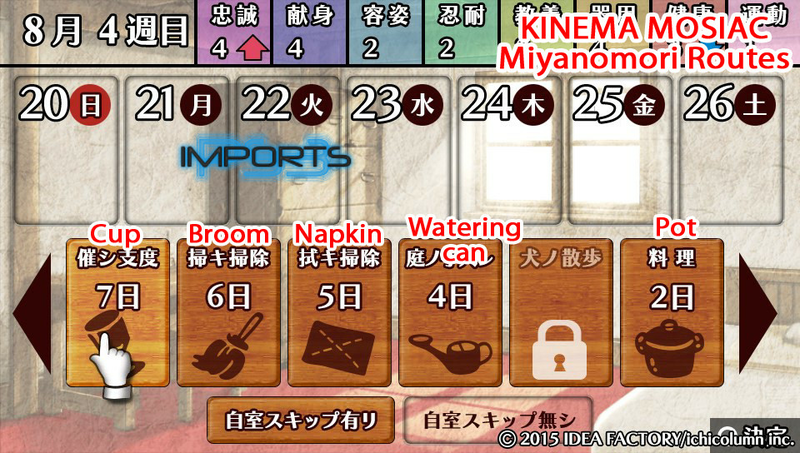 For example, the Napkin icon fills 5 days, and the Pot icon fills 2 days. If I tell you to input both in that order, Napkin, goes on the 1st slot and Pot goes on the 6th slot. I'll choose some icons that will extend past the week, this is on purpose. There are also times where some days are locked; just fill the open spaces you see. For now, choose the right option on the bottom (brown when selected), then the Cup icon. 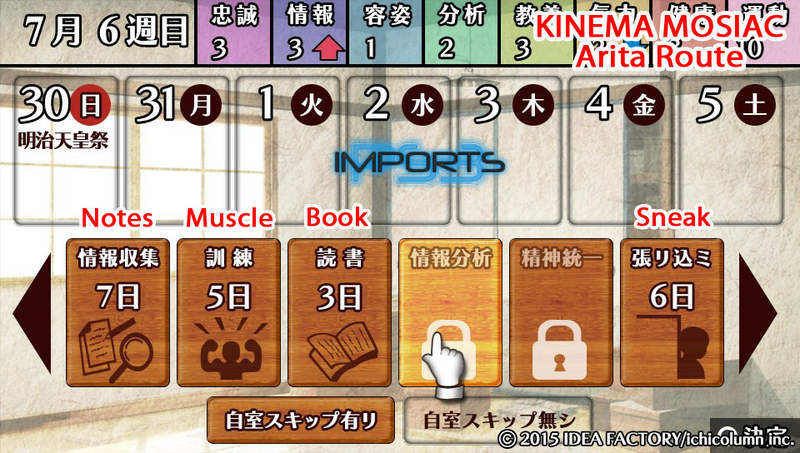 On the screen showing an animation of the girl progressing through the week, choose the middle option at the bottom to speed it up. MAP: Open menu, choose last option (up diagonal to reach it quicker), then left option. I will refer to this step as "Advance" from here on. STATS: Choose the left option at the bottom (brown when selected). Then fill the week with "Zz...". Repeat this until you get a Game Over. Choices don't matter. If you played the first game, you'll remember this part was very long and tedious. Thankfully, the Map skip function actually works now and this process should only take a few minutes. - Go right all the way into next hallway. Continue right and talk to red emote. Always confirm with left option. - Go back left two doors, then up. Go up again into garden. Examine shiny orb. Talk to red emote on right side. - Press , left option. Exit room. - Go down into bottom-left room. Examine shiny orb. Exit. - Go right all the way into next hallway. Continue right and talk to green emote. - Go back left two doors, then up. Go up again into garden. Talk to green emote on right side. Talk to him again. - Go right and down into room. Examine shiny orb (down blue carpet). Exit. - Go right into hallway, go up first door, go up into garden. Talk to green emote on right side. Exit garden. - Go down, go right until you see stairs. Go up them. Talk to red emote, then return downstairs. - Go left and up second door, take left door. Take bottom-left door. Examine shiny orb. Exit, return to stairs and go up them. - Talk to green emote. Talk to her again, then return downstairs. - Go down third door. Examine shiny orb. Return to old lady and talk to her. - Go down into bottom-left room. Open chest at the bottom. Exit. - Go right all the way into next hallway, go down first door. Open chest. - Exit room. Talk to red emote on left. - Go right into next hallway. Go up first door, take right door. Go up first door. Examine shiny orb. - Press , left option. Exit room. Talk to green emote. Talk to her again. - Go right into next hallway, go up the stairs. Go right all the way and down into either door. Examine shiny orb. - Press , left option. Exit room. Talk to green emote. - Exit room. Go immediately down into room. Talk to red emote. Exit. - Go right and down into hallway, enter first door on right. Examine shiny orb. Return to guy you just spoke to, talk to him twice. Exit. - Go right into next hallway, go up the stairs. Go right all the way and up the door (near stairs). Open chest. Exit up. - Go down into room on left. Examine shiny orb. - Press , left option. Exit room. Go immediately down into room. Talk to green emote. - Go right into next hallway, take third door down. Talk to red emote. Go up. - Go right all the way into new area, go left. Examine shiny orb. Exit, and now take bottom door slightly above you. Open chest. Exit this area. - Go up the stairs. Go left and up hallway all the way into terrace. Talk to red emote. Open chest on left side. Exit. - Go down all the way. Go down stairs, talk to green emote. Go down into door. - Go down all the way, left option. You'll be in a town. - Go left all the way and down into building. Open chest. Exit. - Go up into building. Open chest. Exit up. - Go directly right until you hit some trees. There's a chest hidden here. - Continue right and up into building. Open chest. Exit. - Go left and down the road. Talk to red emote in front of right building. - Go down directly into building. Examine shiny orb. Exit. - Go left and up the road, go left and up into building. Examine shiny orb. Exit. - Return to green emote near the right building. - Go down directly and talk to red emote. - Go left all the way and examine shiny orb near top. Return to lady and talk to her. - Go right all the way, left option. - Go up the stairs, go up all the way into terrace. Talk to green emote. Talk to him again. Exit. - Go down the hallway and right, go down the stairs. Go immediately right. - Take bottom-right door. Examine shiny orb. Exit this area. - Retrace your steps upstairs to talk to green emote. STATS: Choose left option at bottom. Then fill the week with "Zz...". Repeat this until you get a Game Over. Choices don't matter. - Go down into bottom-left room. Talk to red emote. Exit. - Go right and down hallway. Talk to red emote. - Go up and right into next hallway. Go up first door, talk to red emote. - Continue up into garden. Examine shiny orb on right. - Press , left option. Exit room. Go down into bottom-left room. Talk to green emote. Exit. - Go right into next hallway. Go down third door, go down twice into town (left option). - Examine shiny orb and talk to red emote above you. - Go left and up into building. Examine shiny orb. Exit up. - Go slightly right and up into building. Talk to red emote. Exit. - Examine shiny orb on left side. Go down into building. Exit down. - Go right and talk to green emote. Talk to her again. - Go right past road and up into building. Examine two shiny orbs. Exit and return to lady you just spoke to. - Go up onto road, go left and up into building. Talk to green emote. - Press , left option. Exit room. Talk to green emote down in the hallway. Then go right into next hallway. go up first door. Talk to green emote. - Go right and down hallway, go outdoors. Examine shiny orb near laundry lines. Go right and up into door. - Go left and talk to red emote. Return outdoors and go down all the way into town. - Go down directly into building. Talk to red emote. Exit. - Go right and up onto road. Talk to red emote. !! This emote might not be here for you. It's an old man at the left corner. If he isn't there, ignore his steps and focus on the lady's quest. - Go left and up into building. Examine shiny orb before entering. Examine shiny orb inside. Exit. - Return to the previous building. Talk to green emote. Talk to her again. Exit. - Go left and down into building. Examine shiny orb. Exit. Return to emote at top of map. - Go up, left option. Examine shiny orb, then go up. Talk to green emote on left. Talk to her again. - Go right all the way and up the door near the stairs. Examine shiny orb. Exit and return to old lady. - Go left, continue left and go down into bottom-left door. Talk to green emote. Exit. - Go right into next hallway, go up the stairs. Go right and up hallway, take left door. Go up top-left room. Open chest. - Press , left option. Exit room, take left door next to your room. Open chest. Exit. - Go right into next hallway, go down third door, go down twice into town. - Go down directly into building. Talk to green emote. MAP: !! This is for the earlier old man's quest. If you got it already, go ahead and Advance. - Exit room. Go down hallway to go outside, go right and then down into town. - Go right and up onto road, talk to red emote. - Go down road and left all the way, go down into building. Examine shiny orb. Exit and return to old man. - Go right and down into door. Talk to red emote. Exit. - Go right into hallway, go up first door. Take right door, go right all the way into new area (warehouse). Go into bottom-left door and examine shiny orb. Exit and talk to red emote. - Press , left option. Exit room, go into top-leftmost room. Examine shiny orb. Exit. - Go right and down into door. Talk to green emote. Talk to him again. Exit. - Repeat second step to return to warehouse. Go into bottom-right door and examine shiny orb. Exit and talk to green emote. - Press , left option. Exit room, go right and down into door. Talk to green emote. Exit. - Go right into hallway, go down third door, go down twice into town. - Go right and up onto road, go left. Talk to red emote. Go slightly right and examine shiny orb. Return to emote, talk to him twice. Again, go right to examine shiny orb, then return to emote. - Go right into hallway, go down third door. Talk to red emote. Go down into town. - Go left and up into building. Talk to red emote. Exit down. - Go right all the way and up into building. Examine shiny orb. Exit. - Go right, left option. Talk to green emote, talk to her again. - Go up twice. Take left door. Examine shiny orb at end of hall. Both the top and bottom-left rooms have chests to open. - Return to vertical hallway and go up into garden. Examine shiny orb on right. Go into top-right door. Open chest. Exit garden. - Go down twice. Talk to green emote, talk to her again. Go down twice into town. - Go left and up into building. Talk to green emote. Exit down. - Go right all the way and up into building. Go up the stairs. Examine shiny orb. Exit. - Go right, left option. Talk to green emote. - Exit room. Go up into top-rightmost room. Open two chests. - Exit room. Go right into hallway, go up stairs. Go right and up hallway, take right door. Take second door up. Open chest. - Press , left option. Exit room, go right into next hallway, go right all the way. Go left into room, go up the stairs. Open chest. Go downstairs, exit, then go up stairs. Open chest on left. STATS: Fill the week with "Zz...". Repeat this until you get a Game Over. Choices don't matter. - Exit room and go into town. - If it's raining, open menu, ninth option, leftmost option. Time of day will be changed. - Go right and up onto road, go right. Talk to red emote. - Go left and down onto road, go left and down into building. Examine shiny orb. Exit and return to emote. - Open menu, ninth option. middle option (夕). Time of day will be changed. - Go right, left option. Go up twice, take right door. Go up first door. Talk to red emote. Exit. - Go right into warehouse, take left door. Examine shiny orb. Exit and return to emote, talk to him twice. Exit. - Go left, go down four times to return to town. - Go right and up into building. Go up stairs. Examine shiny orb. Exit. - Go right, left option. Go up twice, take right door. Go up first door. Talk to green emote. - Exit room. Go right into next hallway, go up the stairs. Go right and up hallway, take left door. Go up top-middle room. Open chest. - Exit room, go right into hallway, go up first door, take right door. Go up first door. Talk to red emote. Exit to first horizontal hallway, then go down three times into town. - Go right and up onto road, go right and up into building. Go down stairs. Open chest. Exit. - Go left all the way and up into building. Examine shiny orb. 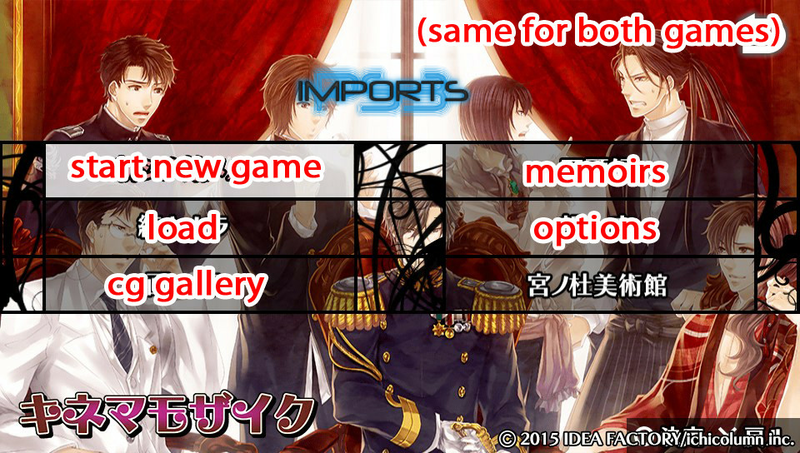 - Open menu, ninth option, fourth option (夜). Time of day will be changed. - Go left, left option. Go up twice, take right door. Go up first door. Talk to green emote. Talk to him again. - Take right door (in same room). Examine shiny orb, return to emote. Exit. - Go left, go up into garden. Talk to red emote. Exit. Go down, go right all the way into next area, go left. Talk to red emote. Shiny orb will appear right above you. Talk to emote twice. Exit this area. - Go up stairs. Go left and up into hallway, take left door. Examine shiny orb. Exit and keep going down until you reach town. - Go up directly into building. Examine shiny orb. Exit. - Go left, left option. Go up three times into garden. Examine shiny orb. Talk to green emote, talk to him again. Go right into room, examine shiny orb. Return to emote. Exit garden. - Go down, go right into next area, go left. Talk to green emote. - Exit room. Go right into hallway, go up first door, go up into garden. Talk to red emote. Exit garden. - Take right door. Go up first door. Examine shiny orb. Return to emote in garden, talk to him twice. Exit garden. - Go down twice. Examine shiny orb. Return to emote in garden. MAP: Keep Advancing until you reach next Stat screen. 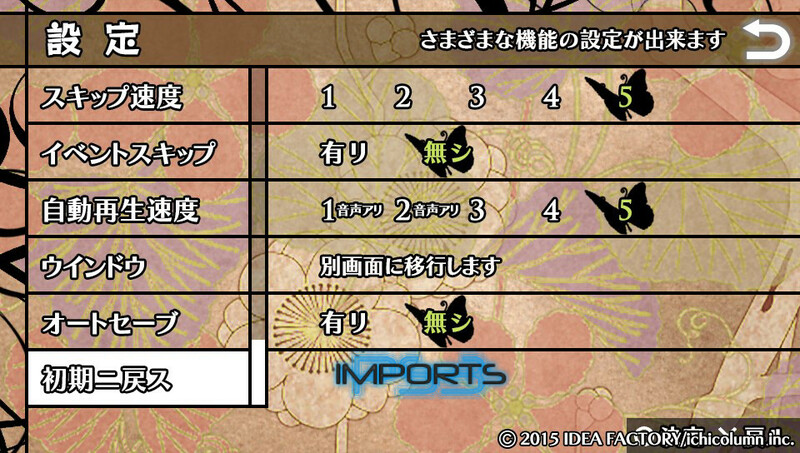 - Open menu, ninth option, fifth option (深夜). Time of day will be changed. - Exit room, go right into hallway, go down third door. Talk to red emote. - Press , left option. Exit room, examine shiny orb. Repeat second step to return to emote. - Exit room. Go right into hallway, go up stairs. Go right and up into hallway, take left door. Go up first door. Open chest. Exit. - Go right, keep going down until you reach town. - Go down into road, talk to red emote. - Go right and up into building. Talk to red emote. Exit up. - Examine shiny orb. Go left all the way and up into building. Talk to red emote. Exit. - Go left and down into building. Exit down. Examine shiny orb. - Go right and down, talk to green emote. Talk to him again. Go slightly right and examine shiny orb. - Go right and up into building. Talk to green emote. Exit up. - Go left all the way and up into building. Talk to green emote. Exit. - Go left, left option. Go up three times into garden. Examine shiny orb. Exit garden. - Keep going down until you reach town. Go down into road, talk to green emote. - Exit room. Go right into hallway, go up stairs, go right and up hallway, take left door. Go down third door. Open chest. - Open menu, ninth option, middle option (夕). Time of day will be changed. - Exit room. Go right into hallway, go right all the way into next area, go left, go up the stairs. Talk to red emote. Go downstairs and exit right. Examine shiny orb near bottom door (the door will fade out once you approach it). Return to emote, talk to him twice. Exit this area. - Go up third door, take right door (ignore red emote). Go up second door, examine shiny orb. Exit and retrace steps back to emote. Exit this area. - Go immediately up stairs. Go down door. Talk to red emote. Exit. - Go left and up hallway, take left door. Go left all the way into terrace Talk to red emote. Return to stairs and go down them. - Go down third door. Examine shiny orb. Go down into town. - Go left, left option. Go up stairs. Go right and down door. Talk to green emote. No need to talk to him again, we can't fulfill this quest now. Exit. - Go left and up hallway, take left door. Go left all the way into terrace. Talk to green emote. Return to the big stairs, go down them and go up into door. - Go up, take right door, go down second door. Talk to red emote. - Press , left option. Exit room, go right and down door. Examine shiny orb. Exit. - Go right into hallway, go up first door, take right door, go down second door. Talk to green emote, talk to him again. - Press , left option. Exit room and go to town. - Go right and up into building. Examine shiny orb. Exit. - Go right, left option. - Go up twice, take right door, go down second door. Talk to green emote. - Exit room. Go right into hallway, go up stairs, go right and up hallway, take left door. Go into bottom-middle door. Open chest. - Exit room. Go right into hallway, go up stairs, go right and up hallway, take left door. Go down first door. Open chest. - Exit room. Go right into hallway, go up stairs, go right and up hallway, take right door. Go down second door. Open chest. We're not done with the previous section, but we need to clear this route first for items that will be carried over. 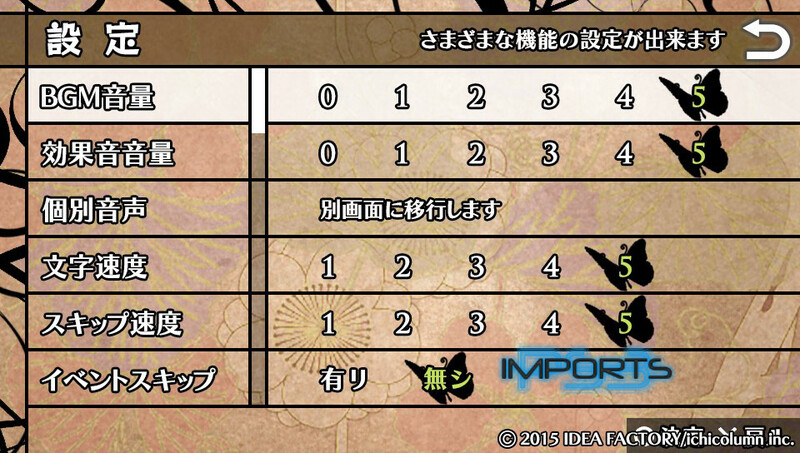 This route has a new on-screen character, new quests, and new icons in the Stat screen. Refer to my shorthand in the first post if you're ever confused. - Get yellow orb above you (you just have to walk through it). Go up stairs for another yellow orb. Go down stairs and exit room. - This area is shaped like a plus sign, and every exit leads to town, so take the closest one to the left. - Go up into building. Get yellow orb and exit up. - Go up into building. Get yellow orb. Talk to red emote. Exit. - Go down into buidling, exit down, examine shiny orb. Return to emote. - Go right and up all the way, left option. Talk to red emote. Go up stairs for yellow orb, then go back down and up door. - Go up, take right door. Examine shiny orb. Return to emote, talk to her twice. Go up stairs. - Go left and down either door. Examine shiny orb. Exit and return to emote. - Go up twice, take right door, go right into warehouse. Get yellow orb on right. Go up middle door. Get three yellow orbs. Open brown chest. Exit warehouse. - Open menu, ninth option, second option. Time of day will be changed. - Go right, go down until you reach town. - Go down into building. Get yellow orb at bottom. Exit. - Go left and down into building. Get yellow orb. Exit. - Go right and up into building before the road (a bookstore). Get yellow orb and open brown chest. Right after you exit, go left behind bulletin board for a two yellow orbs. - Go right and up into building. Get yellow orb near stairs, then go up. Get yellow orb and open brown chest. Go down stairs and exit up. - Go up into building. Get yellow orb and open brown chest. Go down stairs for three yellow orbs. Exit. - Go left until you see red emote, talk to her. - Go right and down road, go down into building on left. Examine shiny orb. Exit and return to emote, talk to her twice. - Go right and down road, go down into building on right. Examine shiny orb and yellow orb. Exit and return to emote. - Go right and up all the way, left option. Go up, go right into next area (grab yellow orb along the way). - Get yellow orb in the middle. Immediately go right into door. Get yellow orb and open chest. Exit. - Take door above you for another yellow orb. Exit. - Go up the stairs. Get yellow orb and open brown chest. Exit this area. - Go up third door, go up into garden. Go into top-right room (get yellow orb along the way). Get yellow orb and open brown chest. - Exit room, go into town. - Go down into alley, talk to two red emotes. - Go up and talk to red emote. - Go right all the way and up into building. Examine shiny orb. Exit up. - Go left until you see shiny orb. Return to the two emotes in the alley. Talk to the one in the blue hat twice. - Go right and down next alley. Get yellow orb at bottom-right corner. There's a brown chest hidden by pink trees at top-right. - Go up the road, go left and up into building. Examine shiny orb. Exit. - Go left, left option. Examine shiny orb near intersection. Go up and get yellow orb. Return to town. - Talk to green emotes in the bottom alley and above in front of the buildings. - Exit room, go into room on right. Get yellow orb and open brown chest. Exit. - Go into town. Go down directly into building. Talk to red emote. Exit. - Talk to red emote above you. - Go right all the way and up into building. Go up stairs, examine shiny orb. Return downstairs and exit up. - Examine shiny orb up on the road. Return to both emotes. Talk to the old man twice. - After exiting store, go right until you see shiny orb. Return to the old man. - Go up into building, exit up, go up into building. Talk to red emote. Exit. - Go right and down road, go right all the way. Examine shiny orb and yellow orb at both top and bottom. Return to emote, talk to him twice. Exit. - Go down into building, exit down, examine shiny orb. Return to emote. Exit. - Go right and up, left option. Go up stairs, take right door. Talk to red emote. Exit hallway. - Go down and left, go down stairs. Go left. Go down first door. Get yellow orb (down blue carpet) and open brown chest at bottom. Exit. - Go left all the way and get yellow orb. Go down into room, examine shiny orb and yellow orb. Exit. - Go down next room, get yellow orb. Exit. - Go right and down hall, take first door. Get yellow orb in bath. Exit. - Go right into next hallway, go up stairs. Go right and up hallway, take right door. Talk to green emote. Exit hallway. - Go down, go down stairs, go up door. - Go up, take right door, go right into warehouse. Take top-left door, get three yellow orbs and open brown chest. - Exit room and go down into door slightly to the right. Get yellow orbs and open brown chest. Exit and go into town. - Go right and talk to red emote at corner of intersection. - Go down all the way, left option. Go up, go right and up into door near stairs. Get yellow orb. Exit and continue right into next area. Go left, examine shiny orb. Get yellow orb at top-left corner, then go up stairs. Get yellow orb at top-right corner. Exit this area. - Go left all the way into next hallway. Go down into bottom-leftmost room. Talk to red emote. Exit. - Go right into next hallway. Go up first door, take left door. Go into all the rooms for yellow orbs, two brown chests, and a shiny orb. Exit hallway when you're done. - Take right door, go into all the rooms here for yellow orbs and a brown chest. Exit hallway when you're done. - Go down. Go left and down into the two doors here for a yellow orb and brown chest. Exit. - Go left into next hallway. Go down into bottom-leftmost room. Talk to green emote, talk to her again. Exit. - Go right into next hallway. Go right all the way into next area. Go left, examine shiny orb. Exit this area. - Go up stairs, go left all the way into terrace. Get yellow orb at top. Exit and go down stairs. - Go left into next hallway. Go down into bottom-leftmost room. Talk to green emote. - Press , left option. Exit room and go into town. - Go right and talk to green emote at corner of intersection. Talk to him again. - Go down all the way, left option. Go up, go right into next area. Go left, examine shiny orb. - Press , left option. Exit room, go into town, and talk to green emote. - Go right and down alley, left option. Go up stairs, go up and take right door. Talk to red emote. Exit hallway. - Go down, go down stairs and up into door. - Go up twice into garden. Talk to red emote on left. Exit garden. - Go down, go left into next hallway. Talk to red emote at end of hallway. - Go right into next hallway, go down second door. Examine shiny orb. Exit and return to emote in previous hallway. - Go right and down alley, examine shiny orb. Continue down, left option. - Go up stairs, go up into terrace. Examine shiny orb on right. Exit. - Take right door, talk to green emote. Exit hallway. - Go up twice into garden. Talk to green emote on left, talk to her again. Exit garden. - Take right door, go right into warehouse. Take top-right door. Get two yellow orbs, go down stairs. Get three yellow orbs and open brown chest. Exit warehouse. - Go left, go down, go right into next area. Go into top-left room (take either door), get three yellow orbs and open two brown chests. Exit down, go down, go up stairs. Examine shiny orb. Exit this area. - Go up third door, go up into garden. Talk to green emote on left. - Exit room and go down into bottom-rightmost room. Get yellow orbs and open brown chest. Exit and go into town. - If it's raining, keep changing time of day one-by-one. For me, it stopped raining by the middle option. - Go up into building, talk to red emote. Exit up. - Go right until you see shiny orb. Continue right and talk to red emote. - Go left and down road, go left and talk to red emote near bottom building. - Go left and up into building. Talk to green emote, talk to her again. Exit down. - Go down into alley, left option. Go up, go down door on right. Examine shiny orb. Exit. - Go left and up door, take right door, go up second door. Examine shiny orb. Exit this hallway. - Go down, go right into next area. Go into top-right door. Examine shiny orb. Exit this area. - Go left all the way into next hallway. Go down first door. Talk to red emote. Exit. - Go down into bottom-leftmost room. Talk to red emote. Exit. - Go up into building, talk to green emote. Exit up. - Go right all the way and talk to green emote. Talk to him again. - Go left and down road, go left and talk to green emote near bottom building. Talk to red emote that appears afterward. - Go right and up into building. Examine shiny orb. Exit and return to emote. - Go down alley, left option. Go up twice, examine shiny orb. - Go down, go right into next area. Go left, examine shiny orb (hidden behind stairs). Exit this area. - Go left all the way into next hallway. Go down first door. Talk to green emote. Exit. - Go down into bottom-leftmost room. Talk to green emote. Examine shiny orb below. Exit. - Go right into next hallway. Talk to red emote. - Continue right into next area. Go into top-left room, examine shiny orb. Exit this area. - Talk to green emote at end of hallway, talk to him again. - Go right and up first door. Talk left door, examine shiny orb at end of hallway. Return to emote, then go up stairs. - Talk to red emote at end of hallway. - Go slightly left and down, go down stairs and up into door. - Go up twice into garden. Examine shiny orb on left. Exit garden. - Go down twice, go up stairs. Talk to green emote on right, talk to him again. - Go left and up hallway, take right door. Examine shiny orb at end of hallway. Return to emote. - Go right and up road, go right and talk to green emote. This is a partial playthrough, pick any choices. - Go right and down into alley, left option. - Go up stairs, take left door. Talk to red emote at end of hallway. - Go right and up into building before the intersection. Examine shiny orb. Exit. - Go down into alley, left option. Go up stairs, take left door. Talk to green emote at end of hallway. - Go up stairs, take right door. Talk to red emote. - Go down into alley, left option. Go up stairs, take right door. Talk to green emote. - Go right into terrace. Talk to red emote. Exit. - Go left, go down, go down stairs and up into door. - Go up, take right door. Go right into warehouse. Examine shiny orb. Exit warehouse. - Go left, go down twice, go up stairs. Go right into terrace, talk to green emote at top. Talk to him again. - Go right all the way and up into building. Go up stairs. Examine shiny orb. Exit building. - Go left and down into alley, left option. Go up stairs, go right into terrace, talk to green emote at top. Exit at bottom. - Go down stairs, go right. Go into top-left room, talk to red emote. Exit this area. - Go up third door, go up into garden. Go into top-right room. Examine the scroll on the wall right as you enter. Open two brown chests. Examine shiny orb. Exit garden. - Go down, go right into next area, go into top-left room. Talk to green emote. Time to take pictures of ghosts. 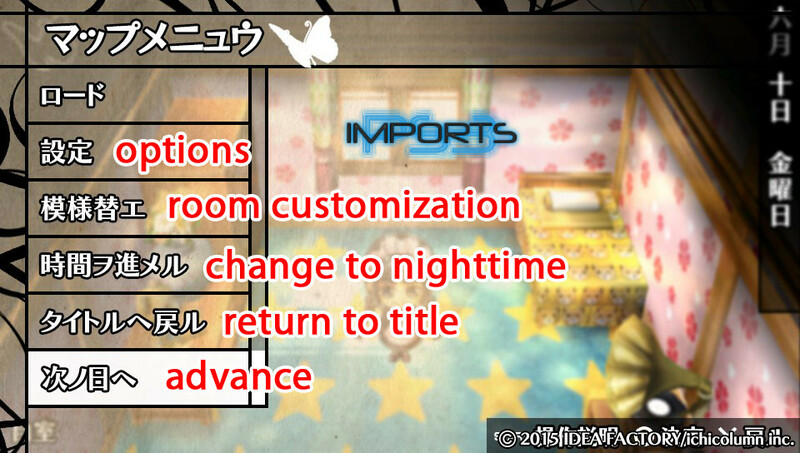 - Open menu, ninth option, fifth option (深夜). Time of day will be changed, and you'll be returned to your room. - Exit room and go down into room. Press , to take picture, left option to save, to back out. Exit. - Go right to end of hallway and up into a small kitchen. Ghost is here. - Go into town. Go right and stop at a small brick pathway on the ground. Ghost is here. - Go up road, go left. Ghost is in front of building with yellow+green roof. Choices and stats don't matter now. When you reach the next Map screen (make sure bottom right option on Stat screen is still selected), go up the stairs and examine the books on the top left. Select the first lady, skip through the story. You can ignore the rest. Make a manual save anywhere, then exit to Title Screen. STATS: Choose right option at bottom. Then choose Cup. - Exit room. Go right and down into room. 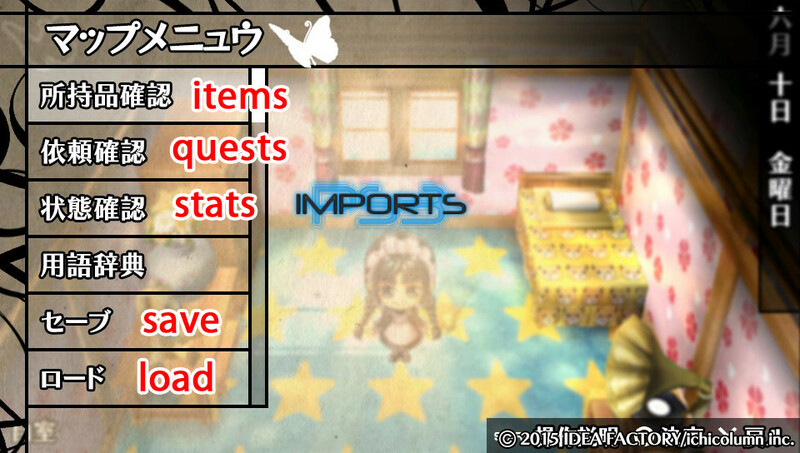 Talk to character at the bottom for an item. Exit. - Go left and down hallway, go outside. Ghost is in front of laundry lines. Return indoors. - Go up, left, down into bottom-left room. Ghost is in middle of room. Exit. - Go right into next hallway. Go up first door, go up into garden. Ghost is on left side. - Still in garden, go into top-right room, examine the wall scroll just as you enter. Ghost is in this room. Exit garden. - Take left door. Go into bottom-left room. Ghost is between the beds. Exit. - Exit hallway, take right door. Go up first door. Ghost is here. Exit. - Go right into warehouse. Go into top-left door. Open chest. Ghost is here. - Exit and go into top-middle door. Open chest. - Exit and go into top-right door. Open chest. Go downstairs and open chest. Ghost is here. Exit warehouse. - Go left, go down twice where the big stairs are. Ghost is here. Return up. - Go right and down either door. Ghost is on right side. Take top-right exit. - Go right into next area. Go into top-left room. Open two chests. Ghost is here. Exit top-right. - Go into top-right room. Ghost is here. Exit. - Go into door below you. Ghost is here. Exit this area. - Go up stairs. Go left and up hallway, take right door. Go down first door. Ghost is here. Exit hallway. - Go up into terrace. Ghost is on left side (stand near railing so door isn't obscuring it). - Open menu, first option, fourth option. Scroll down and select the last orange image. twice, left option. to back out. - Exit room. Go right and down into room. Talk to character at the bottom for an item (if he isn't there, that's fine). - Exit room, go right into next hallway, go up first door. Talk to red emote. Take door next to her, go right into warehouse. Go into top-right room, examine shiny orb. Return to emote. - Go down, go right and up the stairs. Go down into door. Talk to red emote. Exit. - Go left and up all the way into terrace. Talk to red emote. Exit. - Go down, go down the stairs and up into door. - Go up, take right door, go right into warehouse. Go into top-left and top-middle rooms for shiny orbs. Exit warehouse. - Go left, go down twice, go up stairs. Go right and down into door, talk to green emote. Exit. - Go left and up all the way into terrace. Talk to green emote. Exit. - The ten final quests have popped up now. - Go right and down either door. Talk to red emote on right. Take right exit. - Go right into next area, examine shiny orb. Go up stairs and talk to red emote. Exit this area. - Go down first door and talk to green emote. - Go down hallway and take second door. Talk to red emote. Exit. - Go down (outside). Go right all the way, shiny orb is at bottom near the trees. - Go down into town. - Go down into alley, talk to red emote. Go immediately up. There's a bulletin board here and the shiny orb is hidden behind it. Return to emote. - Go left all the way until you see red emote at bottom. - Go up into building. Talk to red emote. Exit up. - Go right until you see shiny orb. After grabbing it, go down into building. Talk to red emote near stairs, then go up. Talk to red emote. Go downstairs and exit down. - Go down and talk to red emote. - Go left past alley and down into building. Examine shiny orb at bottom. Exit. - Go left and talk to green emote. - Go up into building. Talk to green emote. Exit down. - Go left, left option. Go up three times into garden. Go into top-right building, talk to red emote. Examine wall scroll near exit, examine shiny orb and open chest in this room. Exit garden. - Take right door, go right into warehouse. Immediately take right door, examine shiny orb. Exit, take top-right door. Go down stairs, examine shiny orb. Exit warehouse. - Go left, go down, go right all the way into next area. Examine shiny orb on left (hidden by door). Immediately go up into room. Examine shiny orb. Exit room. - Go up stairs. Talk to green emote. Exit this area. - Go down hallway and take second door. Talk to green emote. Exit. - Go down (outside) and go to town. - Go right until you see green emote, talk to them. - Go up into building. Talk to both green emotes here (one is upstairs). - Press , left option. Exit room. Go right into next hallway, go up first door, go up into garden. Go into top-right room, talk to green emote. - Exit room. Go right and down into room. Talk to character at the bottom for an item. Repeat this Stat+Map action until the character isn't there anymore (he'll likely only be there once). Then manually save, return to title, start a New Game and repeat. You will receive a total of 4 items from him. To check, open menu, first option, second option. You should only be missing one of the square-like images by the time you finish getting all 4 items from the guy. Start a New Game, Third option. Select each image and skip through the story. When you're done, save with left option. 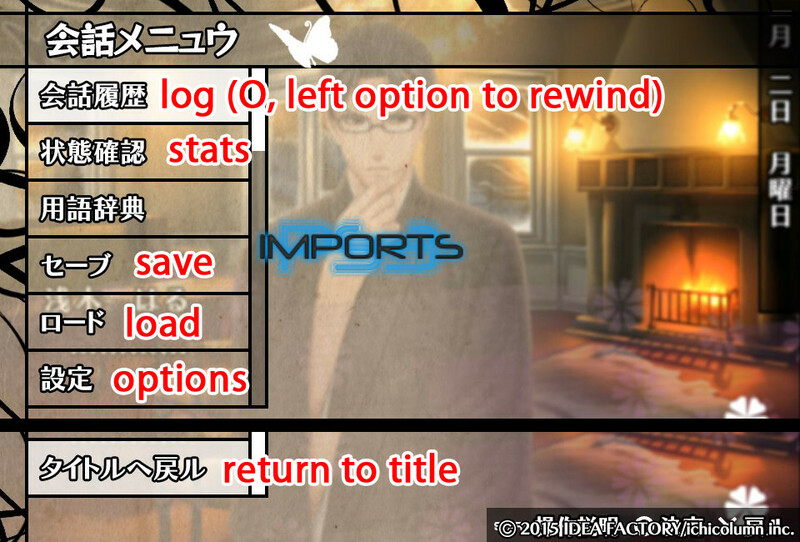 Return to title menu, choose third option on the left side. Each male character has a whiteish image at the end. Select it, to play the story, to back out. Repeat this with each character. Save with left option when you're done. Feels good to get all those trophies after this long c: Time for the second game. Back out of the title screen, then choose the second image. Always choose the right image when starting up. !! During the animation of the girl progressing through the week, choose the middle option on the bottom to speed it up. - Exit room. Talk to red emote. Go right and continue the linear hallway until you reach another red emote. Talk to him, then enter room on his right. Examine shiny orb. Exit and return to first emote. - Go up stairs, go up second door. Talk to red emote. Exit. - Again, go right and continue the linear hallway until you reach another red emote. Continue to the end of the hallway, then go down. Examine shiny orb in bath. - Return to stairs and go down them. Go left, examine shiny orb. Exit. - Follow the hallway until you reach green emote at end. Talk to him twice. - Go right and go down right-most door (an old man is near it). Go down again to the outside. - Examine shiny orb near laundry lines. Here you'll see three sparkling spots (near corner of house, near benches, near rocks at bottom), examine all of them. - Go right for another sparkling spot. Continue right, two sparkling spots at top and bottom. - Return indoors. Go upstairs, go up. Talk to green emote. - Continue up until you hit a door, go into it. Examine shiny orb on right. Exit. - Go up into door on left. Talk to green emote, talk to him again. Exit. - Go left and go downstairs. Go left, examine shiny orb. Exit. - Return upstairs and go up second door. Talk to green emote. Exit and return downstairs. - Go left, open chest. Exit. - Go right until you hit door, go into it. Open chest. Exit. - Follow the hallway until you reach green emote at end. - Exit room. Talk to red emote on left. Go up stairs. - Follow the hallway down until you reach red emote. Talk to him. - Go right and down door (old man is near it). Go down stairs, go up door. - Go left all the way into door. Examine shiny orb. Exit. - Follow the hallway up until you reach green emote. Talk to her. Go up stairs. - Follow the hallway down until you reach green emote. Talk to him. - Go right and down door (old man is near it). Go down stairs, go down twice (left option) into town. - Examine sparkling spot above you. Go left, examine sparkling spot near bench. - Go right, examine sparkling spot between two buildings. - Go up to the next intersection. Examine three sparkling spots in the middle, left, and right. - Go up and stop before the bridge. There's a small path on the left. Go down for three sparkling spots. - Go up the bridge, examine sparkling spot. Immediately go left and up small path for three sparkling spots. 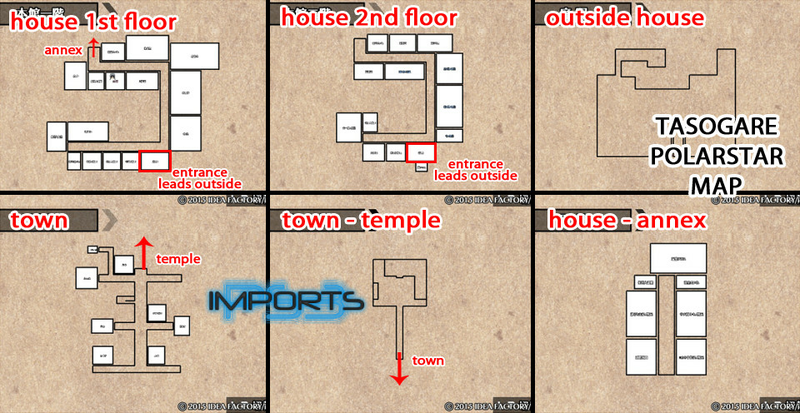 - Return to intersection and go up into new area (temple). Open chest on right (there's one the left we can't open yet). Talk to red emote. - Go right and follow hallway, go right into bottom-most door. Examine shiny orb. Exit. - Go down three times into town. Go up all the way into temple. Talk to green emote. - Exit room. Go right and follow hallway, go right into bottom-most door. Talk to red emote. Exit. - Go down, go up stairs, go up. Talk to red emote on left. - Follow hallway up until you reach the stairs but don't go down them. Go down door, talk to red emote. Exit. - Go up second door, examin shiny orb. Exit. - Now go downstairs. Go left, examine shiny orb. Exit. - Go right and follow hallway, go right into bottom-most door. Talk to green emote. Exit. - Go down twice to the outside. Talk to red emote on right. - Go down into town. Go up into building on right. Examine shiny orb. Exit. - Go up all the way into temple. Talk to red emote. - Go down into town. Go past the bridge then immediately right into building. Examine shiny orb. Exit and return to green emote at temple. - Press , left option. Exit room. Go right and follow hallway, go right into bottom-most door. Examine shiny orb. Exit. - Go down twice to the outside. Talk to green emote on right, talk to him again. - Return indoors, go up stairs, go up. Talk to green emote on left. - Follow hallway up until you reach the stairs but don't go down them. Go down door, talk to green emote. Exit. - Go downstairs, follow hallway down until you reach door going down (old man is near it). Go down twice into town. - Immediately go left and up into building. Examine shiny orb. Exit. - Go left, left option. Go up and right, talk to green emote. - Exit room. Talk to red emote. - Follow hallway down to very end, go left into door. Talk to red emote. Exit. - Go right and down door where the phone on the wall is. Go up stairs, go up. Talk to red emote. - Go down, go down stairs, go down twice into town. - Go up past bridge, go left and up into building. Open chest on top-right. Exit. - Go up into temple, talk to red emote. Examine shiny orb below you, talk to green emote. - Press , left option. Exit room. Go up into green door (annex). - Take left door. Examine shiny orb and open chest. Exit. - Take top-right door. Examine shiny orb. Exit annex. - Talk to green emote near stairs. - Follow hallway down to very end, go left into door. Talk to green emote. Exit. - Go right and down door where the phone on the wall is. Go up stairs, go up. Talk to green emote, talk to him again. - Return to stairs and go down them, go up. Go up into leftmost door, examine shiny orb. Exit. - Return to stairs and go up them, go up. Talk to green emote. - Exit room. Go up stairs. - Follow hallway down to very end, go up and down into both doors for two red emotes. Exit. - Go right and down last door, go down stairs, go down to outside. Talk to red emote. - Go down into town. Go up and left at second intersection, go up into building. Open chest. Exit. - Go up into temple. Talk to red emote. Go down into town. - Go down past bridge, go right into building. Talk to red emote. Exit. - Go down all the way, go left and up into building. Examine shiny orb. Exit. - Press , left option. Examine shiny orb, then exit room. Go up into green door (annex). - Take right door, examine shiny orb. Exit. - Go up all the way into door, examine shiny orb. Exit annex. - Go left, examine shiny orb. Exit. - Go down, open chest. Exit. - Follow hallway and go down door where the phone on the wall is. Go up stairs, go up. - Go left all the way, talk to both green emotes in top and bottom rooms. Talk to the bottom one twice. Exit. - Return to door leading to stairs, go down stairs, go down to outside. Talk to green emote, talk to her again. - Go left and examine shiny orb. - Go down into town. Go up past second intersection and right into building. Talk to green emote. Exit. - Go up into temple, talk to green emote. - Follow hallway down to very end, go down into door. Examine shiny orb. Exit. - Go right and down into door where the phone on the wall is. Go up stairs, go up. - Go left all the way and down door. Talk to green emote. Exit. - Return to stairs, go down them, go down to outside. Talk to green emote. - Go right all the way and up into door. Talk to red emote. Exit. - Go down all the way and down into door. Go down stairs, go down twice into town. - Go left and up into building. Talk to red emote. Exit. - Go up into temple, talk to red emote. - Go up into green door (annex). Go up all the way into door, examine shiny orb. Exit annex. - Go up stairs. Go down into door, examine shiny orb. Exit. - Go right all the way and up into door. Talk to green emote, talk to him again. Exit. - Go left and up into building. Examine shiny orb. Talk to green emote, talk to him again. Exit. - Follow hallway and go right into bottom-most room. Examine shiny orb. Exit. - Go down into door, go up stairs, go up. - Go up all the way into door, talk to green emote. Exit. - Return to stairs and go down them, go down twice into town. - Go left and up into building. Talk to green emote. - Exit room. Go up into green door (annex). Talk to red emote at top. Exit annex. - Go down into door, go up stairs, go down. Talk to red emote. Exit. - Go down stairs, go down twice into town. - Go up into green door (annex). Talk to green emote at top, talk to her again. Go directly right into door. Examine shiny orb. Exit annex. - Follow hallway and go down into door where the phone is. Go up stairs, go down. Talk to green emote. Exit. - Go left and up into building. Examine shiny orb. Exit. - Go right and up, go right at first intersection, continue into building. Examine shiny orb. Exit. - Go up into green door (annex). Talk to green emote at top. - Follow hallway and go down door where the phone is. Go up stairs, go down. Talk to red emote. - Press , left option. Exit room. Go up second door. Examine shiny orb. Exit. - Repeat second step to reach emote again. - Exit room. Go up into green door (annex). There are chests to open in the first right room, second right room, and second left room. Exit annex. - Follow hallway and go down into door where the phone is. Go down to outside. Go left and up where there is a small path leading behind the house. Open chest and examine sparkling spot. - Go to town. Go up and right at intersection, go into building. Open chest. Exit. - Go up into green door (annex). Go into topmost-left room. Examine shiny orb. Exit annex. - Follow hallway and go down into door where the phone is. Go down twice into town. - Exit room. Go up into green door (annex). Go up into top room. Talk to red emote. Exit annex. - Go left, examine shiny orb. Exit and return to emote. - Follow hallway and go down into first door past the phone. Open chest. Exit. - Take door to right, go down twice into town. - Go left and up into building, talk to red emote. Exit. - Go up and left at next intersection, go into building. Talk to red emote. - Press , left option. Exit room. Follow hallway to the very end, go up door. Examine shiny orb. Exit. - Go down door where the phone is. Go down twice into town. - Go left and up into building, talk to green emote. Exit. - Go up past bridge, go left into building. Open chest. - Exit room, go up stairs. - Go down into room. Talk to red emote. Exit. - Follow hallway, go down into door near the flower vase. Go down stairs, talk to red emote. - Go down twice into town. - Go up and slightly past first intersection. Go right into building. Examine shiny orb. Exit. - Go up past bridge, go left and up small path. Go into door, examine shiny orb. - Press , left option. Exit room. go up stairs. - Go down into room. Talk to green emote. - Follow hallway to the very end, go into left room. Open two chests (one is hidden by a barier near top right). Exit. - Go right all the way and down door, go down stairs, go down twice into town. - Go up and left at next intersection, go into building. Talk to green emote, talk to her again. Exit. - Go right all the way into building. Examine shiny orb. Exit. - Go up into temple. Open chest on left. Talk to red emote. Return to town. - Go into building on left. Examine shiny orb. Exit. - Go down all the way, go left, left option. Examine shiny orb near laundry lines. Return to town. - Go up and left at next intersection, go into building. Talk to green emote. Exit. - Go up into temple and talk to green emote. - Exit room. Go up into green door (annex). - Take left door, talk to red emote. Exit annex. - Follow hallway and go down into door where the phone is. Talk to green emote. Go down twice into town. - Go up past bridge, go left into building. Examine shiny orb. - Take left door, talk to green emote. - Exit room. Follow hallway and go down into door where the phone is. Go down twice into town. - Go up all the way into temple. Talk to red emote. Return to town. - Go down past bridge, go right at intersection and into building. Examine shiny orb. Return to emote at temple. - Go left into building. Examine shiny orb. Exit and return to emote at temple. - Exit room. Follow hallway until you reach red emote, talk to him. Go down door next to him, go down twice into town. - Go right and up into building. Talk to red emote. Exit. - Go up and slightly past first intersection, go right into building. Examine shiny orb. Exit. - Go down all the way, go right, left option. - Go up twice, talk to green emote. - Go left and up into room. Examine shiny orb. Exit. - Go right and up into building. Talk to green emote. - Exit room and go into town (you should know the way by now; double-doors at bottom of hall, go down twice). - Go right, left option. Go up twice. Go left and up into room. Examine shiny orb. Exit. - Go up past bridge, enter building on left. Talk to red emote. Exit. - Go up into temple. Examine shiny orb. !! Go to the right stand and examine it. The girl will shake a container and you'll get a ticket. You need a total of 13 unique tickets. Right now, try to get the "大吉" ticket, for which you get a trophy and a shortcut to the temple, the town, and the mansion. This is done by talking to the guy with the carriage that appears on the left of the temple, after getting the ticket. I will be referring to this shortcut from now on. You'll be up here often, so get the remaining tickets over the course of this route. Check your tickets by opening the menu, first option, fifth option. - For now, don't use the shortcut and go down back to town. Go down all the way, go right and up into building. Talk to green emote. Exit. - Go up and left at first intersection, go into building. Examine shiny orb. Exit. - Go up past bridge, enter building on left. Talk to green emote. - Exit room. Follow hallway and take bottom-most right door. Talk to red emote. Exit. - Talk to red emote near bottom door. Go down door, go up stairs, go up. - Go up until you hit a door, take it. Examine shiny orb. Exit. Return to stairs and go down them, go up. Talk to green emote, talk to him again. - Go down door, go up stairs, go up. - Go down leftmost door. Examine shiny orb. Exit. - Return to stairs and go down them, go down into town. - Go right, left option. Go up twice, talk to green emote. Take door above you, talk to green emote, talk to him again. - Return outdoors. Examine shiny orb at top right. Return to emote and talk to him. - Exit room. Go down into room on right. Open chest. Talk to red emote. Exit. - Go left and up stairs. Follow hallway to the very end, go left into door. Examine shiny orb. - Press , exit room. Go down into right of you. Talk to green emote. - Exit room and go to entrance leading to outside. Go up stairs, talk to red emote. - Go down stairs, go down to outside. Take shortcut → third option (out of four, i'm always counting the non-selectable ones too). - Examine shiny orb. Take shortcut → first option. - Go indoors, go up stairs, talk to green emote. Go up, continue up until you see red emote. - Return outside. Take shortcut → third option. - Go indoors, go up stairs, go up, continue up until you see green emote. - After talking to him, go up into nearby door. Talk to red emote. - Press , exit room. - Go up into green door (annex). Talk to red emote at top. Go up into top room. Examine shiny orb. Talk to red emote. Exit annex. - Go up second door. Talk to red emote. Go right (in same room). Examine shiny orb. Exit down twice. Talk to red emote. Exit left. - Go left all the way into room. Examine shiny orb. Exit. - Go down door where the phone is. Go down to outside. Examine shiny orb on right. Return indoors. - Go up, go right. Talk to green emote. Go up (in same room), go up again, take top left door. Talk to green emote. Exit down. - Go left all the way and up into annex. Talk to both green emotes here (one is in top room). Exit annex. - Go up stairs. Go up third door. Talk to green emote. Exit. - Go right into door below you. Open chest at top. Exit. - Press , exit room. Go up into annex, go into top room. Open chest on right. Exit annex. - Go up second door. Open chest. Exit. - Go down hallway and into door leading to outside. Take shortcut → third option. - Go down into town. Go left all the way into building. Talk to red emote. - Press , examine shiny orb, exit room. - Go down into town. Go left all the way into building. Talk to green emote. - Exit room. Follow hallway to door leading to outside, go down into door left of it. Talk to red emote. Exit. - Now go into door leading to outside, go up stairs, go down. Examine shiny orb. Exit. - Go up, go left and up door. Open chest. Talk to red emote. Exit. - Go down second door. Open chest. - Press , exit room, go up into annex. Take top-left door. Examine shiny orb. Open chest. Exit annex. - Follow hallway to door leading to outside, go down into door left of it. Talk to green emote. Exit. - Go into door leading to outside, go up stairs, go up. - Go left and up door. Open chest. Talk to red emote. Exit. - Return to stairs, go down them, go up. - Go left and down second door. Open chest. - Exit room, go up stairs. Follow hallway until you reach red emote, talk to her. - Go down into door, go down stairs, go up. - Go left and down second door. Examine shiny orb. Retrace your steps back to emote. - After clearing the quest, go down into door, go down stairs, go down to outside. Take shortcut → third option. Talk to red emote. - Return outdoors. Take shortcut → third option. Talk to green emote. Always fill the Stat screen with "Hand" from now on. There are no more choices. - Exit room, go up stairs. Go down second door. Open chest. Always fill the Stat screen with "Hand" from now on. - Exit room, go up stairs. Follow hallway until you hit the wall. Go down and take second door on this right wall. Open chest. - Exit room, go up stairs. Follow hallway until you hit the wall. Go down and take third door on this right wall. Open chest. - Open chest, exit room. - Go right and down last door. Go up stairs, go up. Go left and talk to red emote. - Follow hallway up to the top, talk to red emote. - Go down stairs, go down. Examine shiny orb. Exit and return upstairs to emote. Talk to her twice. - Press , exit room. Go left into door. Talk to red emote. Exit. - Go right and down last door. Take shortcut → second option. - Go left and up into building. Examine two shiny orbs. Exit. - Take shortcut → third option. Open chest on right. Go down into town. Go left and up into building. Open chest on left. Talk to red emote. Exit. - Go down past bridge, go left down small path. Open chest. Return to road. - Go left at intersection and into building. Open chest on right. - Press , exit room. Go right all the way into door. Examine shiny orb. - Go up (in same room). Open chest. - Go up again (in same room). Open chest. - Take top door. Open chest. Exit down. - Go down. Open chest. Exit. - Go left all the way into door. Open chest. Exit. - Go up stairs. Talk to green emote. - Follow hallway down until you see green emote. Talk to her. - Go left and down last door. Examine shiny orb. Exit. - Go up. Open chest. Exit. - Go right and down the double doors. Go down into door. Open chest. Exit. - Go down stairs, go up. Go left and down second door. Open chest. Exit. - Go left all the way into door. Talk to green emote. Exit. - Return outside (bottom double doors in this hallway). Go right and down, open chest. Take shortcut → third option. Go down into town. - Exit room. Follow hallway up until you reach the stairs, go up them. - Go up second door, talk to red emote. Exit and return downstairs. - Go up second door, examine shiny orb. Exit. - Return upstairs to emote, talk to him. - Exit room and go outside. Talk to red emote on left. Go down into town. - Go right and up into building. Open chest. Exit. - Go up slightly past first intersection, go right into building. Talk to red emote. - Press , examine shiny orb. Exit room and go outside. - Talk to green emote on left, talk to him again. Examine shiny orb on bottom right. Go down into town. - Go up slightly past first intersection, go right into building. Talk to green emote. Exit. - Go down all the way, go left, left option. Talk to green emote on top left. - Exit room and go outside. Take shortcut → third option. Talk to red emote. - Take shortcut → second option. Go left and up into building. Talk to two red emotes. - Press , exit room. Follow hallway up to the top, go left into door. Examine two shiny orbs. Exit. - Go down third door. Examine shiny orb. Exit. - Go down hallway and go outside. Take shortcut → third option. Talk to green emote. - Take shortcut → second option. Go left and up into building. Talk to two green emotes. Exit. - Go up past bridge. Go right all the way into door. Open chest. - Go down. Open chest. Exit up, go right. Open chest. - Exit room. Go right and go down last door. Talk to red emote. - Exit room. Follow hallway, take second door on right wall. Talk to red emote. Exit and go outside and down into town. - Go up and right at first intersection, go into building. Examine two shiny orbs. Talk to red emote. Exit. - Go up past bridge, go left into building. Examine shiny orb. Exit. - Return to building you were just in. Talk to green emote, talk to him again. Exit. - Press , exit room. Go left into door. Examine shiny orb. Exit. - Follow hallway, take second door on right wall. Talk to green emote, talk to her again. Exit and go outside and down into town. - Go up and right at first intersection, go into building. Talk to green emote. Exit. - Go up past bridge, go left and up into building. Examine shiny orb. - Press , exit room. Follow hallway, take second door on right wall. Talk to green emote. - Exit room. Go right and down last door. talk to green emote. - Exit room and go to town. - Go up and left at first intersection, go into building. Talk to red emote. - Press , exit room. Follow hallway up and take stairs up. - Go up third door. Examine shiny orb. Exit. - Go down all the way and down into door. Go down stairs, go down and go to town. - Go up and left at first intersection, go into building. Talk to green emote. - Exit room. Follow hallway, take bottom door on right wall. Talk to red emote. - Exit room. Follow hallway right until you see red emote, talk to him. - Go down into door, talk to red emote. - Go down to town. - Go up and left at first intersection, go into building. Examine shiny orb. - Press , exit room. Follow hallway up to the end, go up the stairs. - Go up second door, examine shiny orb. - Press , exit room. Go right and down last door. Talk to green emote. - Exit room. Follow hallway, take bottom door on right wall. Talk to green emote, talk to him again. Exit. - Go downstairs, go down outside. Take shortcut → third option. Examine shiny orb. Go down into town. - Go left and up small path, go into door. Examine shiny orb. - Press , exit room. Follow hallway and talk to green emote. - Go right, talk to green emote. - Exit room and go outside. Take shortcut → third option. Go down into town. - Go right into door, go right. Examine shiny orb, talk to red emote. - Press , exit room. Follow hallway up to the end, go left into door. Examine shiny orb. - Return outside (go down double doors at bottom of hall). Take shortcut → third option. Go down into town. - Go right into door, go right. Talk to green emote, talk to her again. - Press , exit room. Go right and down last door, go up stairs, go up. Examine shiny orb. Go down, go down stairs, go down outside. Take the shortcut and make your way back to the emote. - Exit room. Follow hallway, take bottom door on right wall. Talk to red emote. Exit. - Go down, go up stairs, go down. Talk to green emote. Exit. - Go up, go up and talk to red emote. - Go up into door, talk to red emote. - Return to stairs, go down them and go outside. Take shortcut → third option. Examine shiny orb. Go down into town. - Press , exit room. Follow hallway, take bottom door on right wall. Talk to green emote. Exit. - Go down, go up stairs, go up, go up all the way into door. Talk to green emote, talk to him again. Exit. - Return to stairs, go down them and go to town. - Go right, left option. Go up indoors, go up stairs, go up, go up all the way into door. Talk to green emote. - Go right into door, go right. Examine shiny orb. - Exit room. Go right and down last door. Go up stairs, go up, go up and talk to green emote. - Press , exit room. Talk to red emote. - Exit room. Go down door to your right. Examine shiny orb. Exit and talk to green emote. - Go outside. Go left and up a small path leading behind the house. Open chest. - If you do not have all the tickets from the temple, now is the time to get them. - To take pictures: Press , , left option to save, to back out. - Exit room, go up. Ghost is here in kitchen. Exit. - Go right all the way into door. Ghost is here. - Go up twice (in same room). Ghost is here. - Take top left door. Ghost is near fireplace. Exit down. - Go left and up stairs. Go down first door. Ghost is near fireplace. Exit. - Go up third door. Ghost is on right. Exit. - Follow hallway down and take double door at the bottom (near the flower vase). Go down stairs, go down to outside. - One ghost is near the laundry lines on left. One ghost (a dog) is right of entrance. - Go left and up into building. Ghost is here. Exit. - Go up to first intersection. Ghost is here. - Go right into building the ghost is near. Ghost is inside. Exit. - Go up past bridge, go left and up small path, go into door. Ghost is here in hot springs. Exit. - Once you go down the path, go up into building on right. Ghost is here. Exit. - Continue right past intersection. Ghost is on bridge. - Continue right into door. Ghost is here. - Go down. Ghost is on bottom left. Exit this area. - Go up into temple. Move forward slightly. Ghost is on steps. - Go up into top area. Ghost is here. Now keep inputting "Hand" on all stat screens until the date on the top says "1月1日" and the background is blueish-white. - Exit room, go into town, go up to the temple. Ghost is in the top area. Choices don't matter. 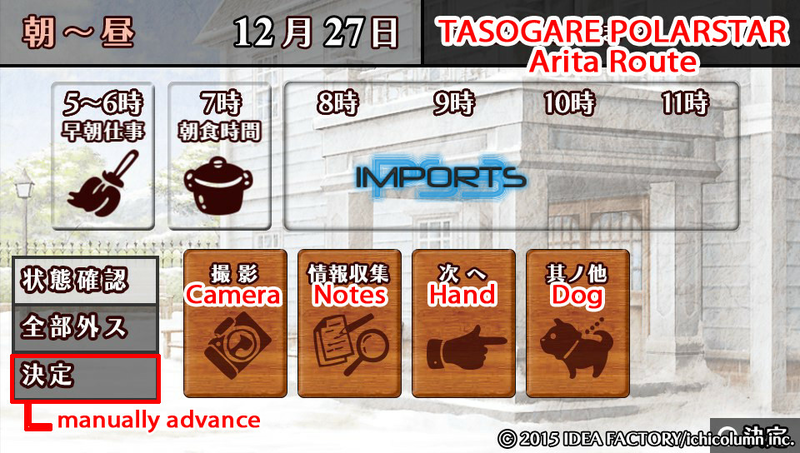 Keep inputting "Hand" on all stat screens until the date on the top says "12月28日" and the background is blueish-white. MAP: Exit room, go up door left of stairs. Go up into top room. Ghost is near table at top. Start a New Game, Third option. Select each image and skip through the story. When you're done, save with left option. Return to title screen, choose third option on the left side. Each male character has a whiteish image at the end. Select it, to play the story, to back out. Repeat this with each character. Save with left option when you're done. Start one more new game (first option; character selection doesn't matter) and play until the Stat screen. You will get your last item.